"Bearish sentiment is everywhere. Investors have finally realized what we have been discussing for the last two years. And now that we are near a temporary bottom, some investors are taking action. Unfortunately, investors are reacting to the past. They should have been in cash during the downtrend...Instead, investors should be positioning themselves for a counter trend rally: by either not selling their stocks or if they are in cash, by considering market exposure (depending on your risk tolerance)." With the market up roughly 20% in 2 weeks, investors now want to know how to reallocate their portfolio to profit from the bounce. How sentiment has changed! It is hard to believe that in the beginning of this month, investors were selling their stocks to buy CDs. Because the market has come up so far and so fast we are now less sure that we have established a multi-month bottom. So we will take a wait and see approach until the retest of the early March low. However investors should sell their Bond positions as we continue to expect long term interest rates to rise despite the Fed’s attempt to manipulate the market. J. Wayne Fears in The Complete Book of Outdoor Survival states; "Survival instructors teach that the first thing to do once you realize you are lost is to STOP." STOP stands for Sit, Think, Observe, and Plan. "By following this simple outline you can control your urge to panic." Some investors may find this useful as they examine their recent brokerage statements. Sit. "By sitting down you can prevent getting into deeper trouble. This one act can also start the thinking process, and it suppresses the urge to run or to make hasty decisions. You may need this time to get over the initial shock that you are lost." Think. "In a survival emergency, man is at the mercy of his mind. That is the reason many survival experts refer to the mind as the best survival kit. In order to survive, one must keep control of the mind by thinking back to past training, by determination, and by maintaining a positive mental attitude." Observe. "Observe your surroundings to discover what problems must be solved and what resources you have to solve them." Plan. "Now that you are organized, set plans. Maintain a good survival spirit. Dispel fears." While Bankers have been living the high life (until recently), farmers have been going through a tough few decades. We found a useful list of "101 Ways To Save Money" on the Alabama Cooperative Extension System website. But there have been periods in economic history when farmers and ranchers were considered the big men of the day. As Jim Rogers has stated, in the next decade the farmers (and not the bankers) will be driving the Maseratis. 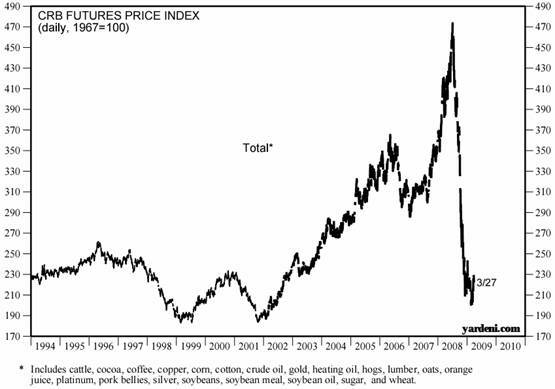 Since that time, some commodities have gone up in a frenzy (which in May 2008 we warned would collapse). And collapse they did! The following chart shows the CRB Index which is near those long term lows once again. And what can we expect at a major bottom in commodities? Let us look back to the early 30s, a bottom that supported a multi-decade commodity bull market. "To begin with, quantities of farmers had lost their farms during the hideous early years of Depression- lost them by reason of debt. These farms had mostly fallen into the hands of banks or insurance companies, or of small-town investors who had held the mortgages on them, or were being held by government bodies for non-payment of taxes, or had been bought in at tax sales (Since Yesterday by Fredrick Lewis Allen)." In addition to farm foreclosure, there was a drop in prices due to a lack of demand (Great Depression) and a drought of epic proportions which led to the Dust Bowl. "In the callous old Wall Street phrase, the farms of the United States had been "passing into stronger hands"; and that meant that more and more of them, owned by people who did not live on them, were being operated by tenants....More and more the farm owner, whether or not he operated his own farm, was coming to think of himself as a business man, to think of farming as a business. He was less likely to use his farm as a means of subsistence, more likely to use as much of it as possible for the growing of crops for sale...A striking example of this trend was the appearance of the "suitcase farmer" - a small town business man who bought a farm or two, cleared them of houses and barns, spent a few weeks each year planting and harvesting them, (using his own tractor or a hired one), and otherwise devoted himself to his business, not living on the land at all. A Kansas banker told Ladd Haystead, toward the end of the decade, that he estimated that between twenty and thirty per cent of the land in western Kansas was owned by suitcase farmers. This was what was happening to the territory when the victims of drought had fled!" (Since Yesterday by Fredrick Lewis Allen). And how did this contrarian suitcase farmer fare? "Farm prices rose. For example, the farmer who had received, on the average, only 33 cents a bushel of wheat in 1933 received 69 cents in 1934, 89 cents in 1935, 92 cents in 1936, $1.24 in 1937 and 88 cents in 1938. The cotton farmer who had received an average price of 5.6 cents a pound for his cotton in 1933 received between 10 and 13 cents during the next four years, and 7.9 cents in 1938." "With the cash you have raised from selling assets, we recommend a portfolio of 3 month U.S. Treasury Bills, which protect principal. We do provide this service, but we want to stress that you can call your financial consultant tomorrow to allocate everything into a U.S. Government-only money market fund. While this is not ideal, it will initially protect investors, until more evidence demands further preservation and our services. History shows that most investors will not take action, but those that do, will be able to eventually buy assets at bargain prices." After doing a review of the contents of various money market funds, many are still holding short-term debts of the Enron-like entities known as SIVs that hold leveraged mortgage assets. We see no way around money market fund investors taking losses and possibly being faced with frozen funds such as happened to auction rate securities holders. To quote one investor: “It’s a moral outrage...Their pitch was, keep your cash with us, we get a higher rate.” And while we may have a bounce in confidence for a few months, we urge investors to begin the process of moving your cash to higher ground (U.S. Treasury Bills) for the next down leg. If long term interest rates rise as we expect, interest rate derivatives should provide more fireworks for the financial sector.